This essay is the product of research undertaken for the first volume of The People’s Book Project. Please donate to help the first volume come to completion: a study of the institutions, ideas, and individuals of power and resistance in a snap-shot of the world today, looking at the global economic crisis, war and empire, repression and the global spread of anti-austerity and resistance movements. I would like to introduce you, the reader, to some realities of our global banking system, resting on the rhetoric of free markets, but functioning, in actuality, as a global cartel, a “super-entity” in which the world’s major banks all own each other and own the controlling shares in the world’s largest multinational corporations, influence governments and policy with politicians in their back pockets, routinely engaging in fraud and bribery, and launder hundreds of billions of dollars in drug money, not to mention arms dealing and terrorist financing. These are the “too big to fail” and “too big to jail” banks, the centre of our global economy, what we call a “free market,” implying that the global banks – and corporations – have “free reign” to do anything they please, engage in blatantly criminal activities, steal trillions in wealth which is hidden offshore, and never get more than a slap on the wrist. This is the real “free market,” a highly profitable global banking cartel, functioning as a worldwide financial Mafia. In October of 2011, New Scientist reported that a scientific study on the global financial system was undertaken by three complex systems theorists at the Swiss Federal Institute of Technology in Zurich, Switzerland. The conclusion of the study revealed what many theorists and observers have noted for years, decades, and indeed, even centuries: “An analysis of the relationships between 43,000 transnational corporations has identified a relatively small group of companies, mainly banks, with disproportionate power over the global economy.” As one of the researchers stated, “Reality is so complex, we must move away from dogma, whether it’s conspiracy theories or free-market… Our analysis is reality-based.” Using a database which listed 37 million companies and investors worldwide, the researchers studied all 43,060 trans-national corporations (TNCs), including the share ownerships linking them. The mapping of ‘power’ was through the construction of a model showing which companies controlled which other companies through shareholdings. The web of ownership revealed a core of 1,318 companies with ties to two or more other companies. This ‘core’ was found to own roughly 80% of global revenues for the entire set of 43,000 TNCs. And then came what the researchers referred to as the “super-entity” of 147 tightly-knit companies, which all own each other, and collectively own 40% of the total wealth in the entire network. One of the researchers noted, “In effect, less than 1 per cent of the companies were able to control 40 per cent of the entire network.” This network poses a huge risk to the global economy, as, “If one [company] suffers distress… this propagates.” The study was undertaken with a data set established prior to the economic crisis, thus, as the financial crisis forced some banks to die (Lehman Bros.) and others to merge, the “super-entity” would now be even more connected, concentrated, and problematic for the economy. In the United States, five banks control half the economy: JP Morgan Chase, Bank of America, Citigroup, Wells Fargo, and Goldman Sachs Group collectively held $8.5 trillion in assets at the end of 2011, which equals roughly 56% of the U.S. economy. This data was according to central bankers at the Federal Reserve. In 2007, the assets of the largest banks amounted to 43% of the U.S. economy. Thus, the crisis has made the banks bigger and more powerful than ever. Because the government invoked “too big to fail,” meaning that the big banks will be saved because they are very important, the big banks have incentive to make continued and bigger risks, because they will be bailed out in the end. Essentially, it’s an insurance policy for criminal risk-taking behaviour. 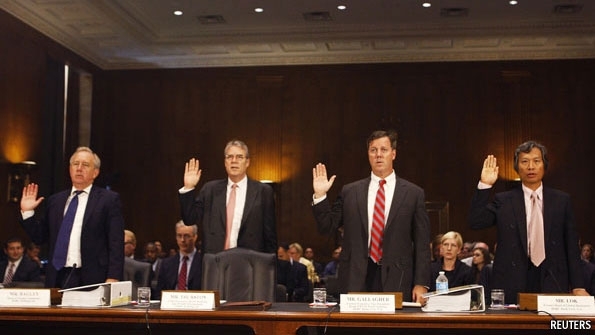 The former president of the Federal Reserve Bank of Minneapolis stated, “Market participants believe that nothing has changed, that too-big-to-fail is fully intact.” Remember, “market” means the banking cartel (or “super-entity” if you prefer). Thus, they build new bubbles and buy government bonds (sovereign debt), making the global financial system increasingly insecure and at risk of a larger collapse than took place in 2008. When politicians, economists, and other refer to “financial markets,” they are in actuality referring to the “super-entity” of corporate-financial institutions which dominate, collectively, the global economy. For example, the role of financial markets in the debt crisis ravaging Europe over the past two years is often referred to as “market discipline,” with financial markets speculating against the ability of nations to repay their debt or interest, of credit ratings agencies downgrading the credit-worthiness of nations, of higher yields on sovereign bonds (higher interest on government debt), and plunging the country deeper into crisis, thus forcing its political class to impose austerity and structural adjustment measures in order to restore “market confidence.” This process is called “market discipline,” but is more accurately, “financial terrorism” or “market warfare,” with the term “market” referring specifically to the “super-entity.” Whatever you call it, market discipline is ultimately a euphemism for class war. The Fifth Estate is a modern extension of the four classical Estates of the Realm. The Fifth Estate is most strongly associated with bloggers, journalists, and media outlets that operate outside of the mainstream media. Triggering our age of high-stakes secrecy, explosive news leaks and the trafficking of classified information, WikiLeaks forever changed the game. Now, in a dramatic thriller based on real events, THE FIFTH ESTATE reveals the quest to expose the deceptions and corruptions of power that turned an Internet upstart into the 21st century’s most fiercely debated organization. CounterPunch is a bi-monthly magazine published in the United States that covers politics in a manner its editors describe as “muckraking with a radical attitude”. It has been described as left-wing by both supporters and detractors. Media Roots: Founded by Abby Martin, the former host of RT’s Breaking the Set, Media Roots is a citizen journalism project that reports the news from outside of party lines. Abby believes that just as the root system of a tree is more important that the tree itself, independent media is integral to the foundation and survival of a democracy. Graduating from San Diego State with a Bachelor’s degree in political science, Abby’s Media Roots regularly features exclusive podcasts discussing the latest world events with her brother Robbie. Real News Network: Since 2007 the Real News Network has produced more than 7,000 stories that have been viewed more than 100 million times. Producing high-quality video news released on their Youtube channel covering the biggest stories of the day, the Real News Network puts the focus on working peoples’ rights, for peace, for the health of our planet, and consistently shines a light on the racism inside the United States. The Anti-Media: One of the fastest growing news outlets in the world, last Fall the Anti-Media soared into the 25,000 most visited websites in the world. During anti-police protests across America, the Anti-Media consistently published articles on breaking police brutality cases and several of their original reports went viral on social media with hundreds of thousands of shares. Of course, each story was featured by the Anti-Media days before the corporate outlets even knew what had happened. The Corbett Report: With over 1,000 episodes, the Corbett Report has most definitely earned their reputation as one of the hardest working and most-trusted news sources in the world. The Corbett Report has uniquely developed their own team of investigative fans who research the most-requested topics. The information is archived and analyzed by James Corbett, who then turns the sources into an easy to understand video news report. Preferring to describe the service he provides as ‘open source intelligence‘, the Corbett Report has been a favorite of mine for many years. StormCloudsGathering: If you’ve ever thought the corporate media was hiding something from you, you’re right, and you’ll absolutely love the hard work and fact-checking StormCloudsGathering puts into all of their videos. Amazingly talented at relating world events to a larger geopolitical agenda, I’m confident that whenever you start following StormCloudsGathering you’ll have a new found appreciation for the label ‘conspiracy theorist‘… What ‘theory‘? SCG strategically uses sources only from the mainstream media for maximum credibility. Why has ‘critical thinking‘ been demonized? Ben Swann: A former local Fox anchor in Cincinnati, Ohio with 2 Emmy Awards under his name, Ben Swann has 14 years of experience working as a journalist in broadcast news. In 2012 he was the first journalist in the world to directly interview President Barack Obama about the Constitutionality of his “kill list”. Ben Swann’s independent news outlet is dedicated to restoring power the people by speaking truth to power through media, culture, and technology to empower the voice of the people toward liberty and freedom. Mint Press News: An independent watchdog journalism organization, Mint Press News provides original reporting, in-depth investigations, and thoughtful analysis of the most pressing topics facing our nation. Their relentless coverage of US foreign policy decisions always digs deep into the influence of special interest groups, big business and lobbying efforts and how they shape policies at home and abroad. Russell Brand: Last year the corporate media was stunned to discover that famous celebrity Russell Brand had started his own video series called ‘The Trews’ to combat false narratives and educate the public on massive worldwide corruption. He toured the world public speaking in support of his book ‘Revolution’ and made waves in the UK during an interview he dominated with Newsnight’s Jeremy Paxman on the BBC. Possessing an elite vocabulary, unmatched confidence, other-worldly debate skills and more than 9 million Twitter followers, Russell has suddenly become a spokesperson for people across the world who have been touched by the global political awakening. The Intercept: Not long after Edward Snowden’s release of secret NSA documents, journalist Glenn Greenwald launched a new media project called the Intercept with Laura Poitras and Jeremy Scahill. The outlet is owned by First Look Media, a new project started by Paypal’s co-founder Pierre Omidyar. Compared to other outlets on this list, the Intercept is technically the ‘most corporate‘, but the content released thus far has been packed full of exclusive data that the Obama administration surely doesn’t want you to read about. Consortium News: Former AP journalist Robert Parry was one of the reporters who exposed the Iran-Contra scandal for the corporate media in the mid-80s. In 1995, he founded Consortium News as the first investigative news magazine on the Internet. Robert believes the distortion of information is an urgent problem with millions of Americans brainwashed by the waves of disinformation coming from the mainstream media. Since the beginning of the crisis in Ukraine, Consortium News has consistently published fantastic investigative articles into the situation, without the pro-coup US media bias. We are swamped with news every single day. 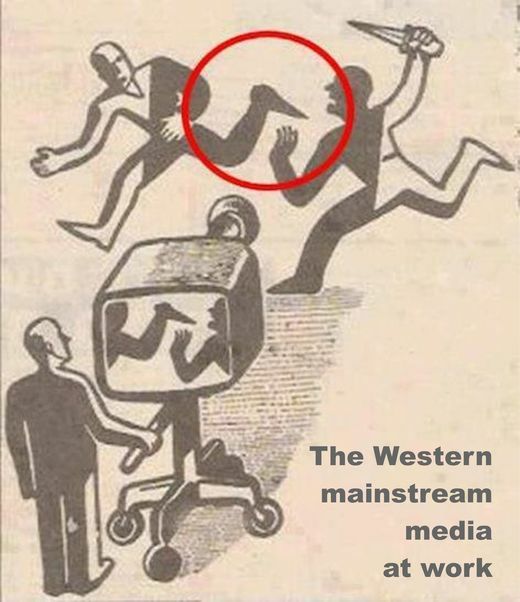 We all say that the media lie, but there’s a problem: most events are usually portrayed in a contradictory fashion in different media outlets. So while we have access to a lot of information and we know that a large part, maybe even the majority of the reported news in mainstream media (but also in alternative media), is either wrong or plain propaganda – COINTELPRO – how can we know what’s really going on? What Is Change Media University?